We’ve been toying with addition off and on for a good long while now, but as she’s preparing for first grade starting this summer, E has started asking for “homework” (again – she went through a “homework” phase a while back as well). This has caused me to be a little more systematic about what we work on, and I’ve been trying to get a better view of where she’s at before she even starts school. I’ve come to realize that while she can do addition up to 10 and LOVES saying “Do you know what 10 plus 10 is? It’s 20! Do you know what 20 plus 10 is? It’s 30!” and on and on, she’s not actually fluent in addition up to 10 and spends a lot of time thinking about it and guessing wrong. 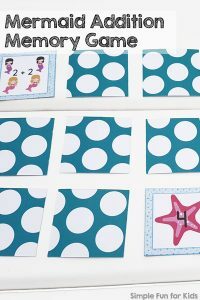 To increase her exposure to addition and help her get fluent, I’ve used her new-found interest in domino games and made her some rainbow domino addition games. 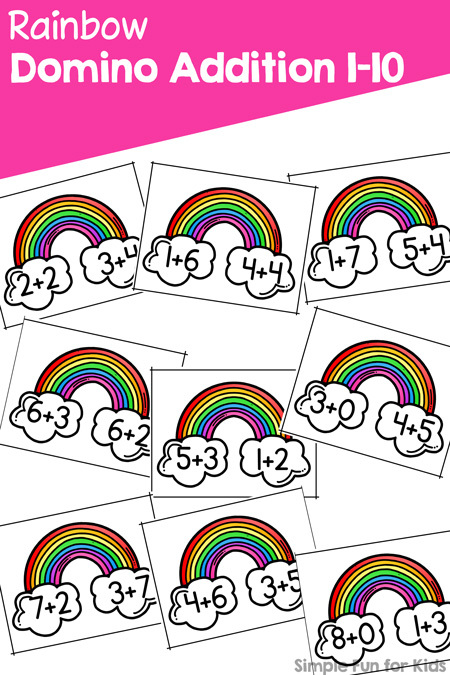 Today, I’m sharing a version that has two addends on both sides of the rainbow domino for matching. Printable file (download below for free). 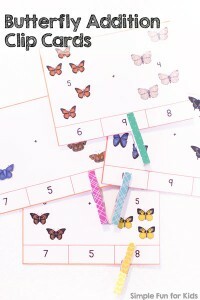 The file includes one page of 25 rainbow dominoes. 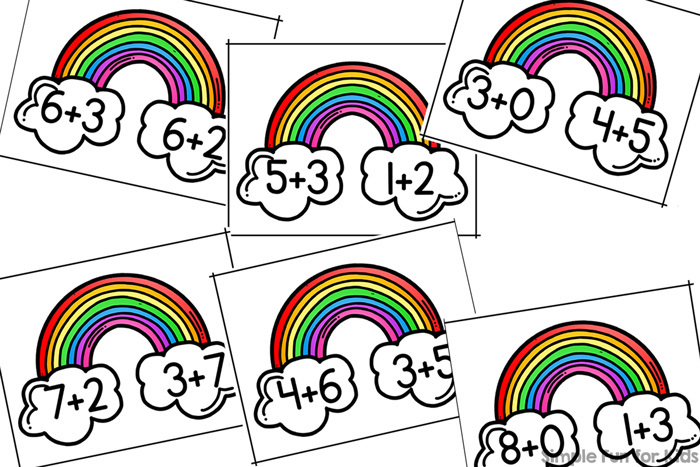 They each have two addends on both sides of the rainbow for kids to match different ways to make the same number. 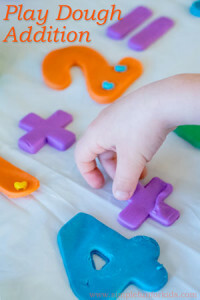 Number bonds from 1 to 10 are included. Print the page, laminate it (optional), and cut it apart at the black lines. Spread out the cards on a table, pick one card to start with, and line up the cards matching adjacent sums. You can play a full dominoes game or just focus on the addition with all cards face up. 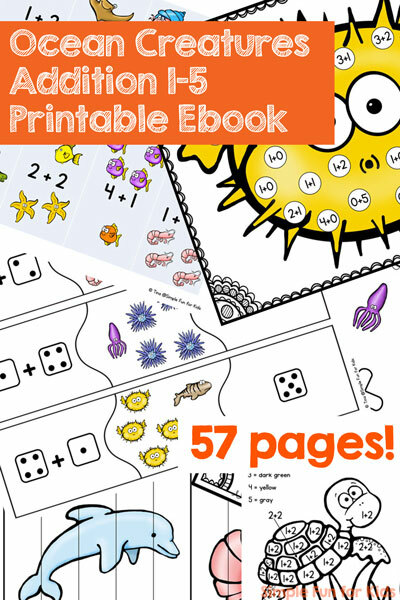 Download your Rainbow Domino Addition printable! Or click here to see this page on my membership site, become a VIP member today, and get access to an extra page for this printable! 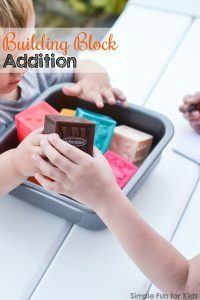 Are you looking for more addition practice? Here are a few other activities!